1.1 The Methodist Church is committed to protecting, advocating and advancing the interests of Methodist Heritage throughout the Connexion, with a particular focus on the role of Methodist heritage as a tool for the contemporary mission aims of the Methodist Church. 1.2 This includes the responsible and effective management of historic artefact collections both inside and outside accredited Methodist museum collections where their heritage significance has a clear missional value. 1.4 The policy is informed by the Church's Standing Orders 212 (11) (Methodist Church: Particular Functions), 337 (Methodist Heritage) and 936 (Historic Artefacts). 1.5 This policy also relates to the SO015 Archives and SO 943 Closure of Chapels. 1.6 This policy applies to artefacts and other historic materials that are model trust property and that the Methodist Council judges to be of historic significance to the Church. 1.7 Historic artefacts refers to objects (usually portable) that have been assessed to be of Methodist significance through their cultural and missional value at a site, community or Connexional level that are not either archives or structural features - examples would include crockery, furniture, paintings and Bibles. 1.8 The Methodist Church is committed to managing its artefacts in accordance with the Museums Association Code of Ethics. Accredited museums within the Methodist Church accredited under the UK Museums Standards Scheme will follow their accreditation compliant policies, plans and procedures for development, management and access to their collections. 1.9 The Methodist Church will observe due diligence to ensure that historic artefacts are acquired and disposed of legally and ethically. 2.1 Accredited Museums will adhere to the terms of their Collections Development Policies in relation to acquisition and disposal from their collections. 2.2 Local Churches and other Methodist heritage sites should follow the connexional guidance documents when considering the acquisition or disposal of an historic artefact. Any potentially Connexionally significant acquisitions should be referred to the Heritage Committee for information and decision where necessary. 2.3 It is strongly recommended that the Church's guidance on assessing significance and taking appropriate action thereafter is used to help trustees and others to identify historic artefacts of site, local, and connexional, Methodist significance to inform appropriate management and care. 3.1 Maintaining accurate, secure and consistent information about historic artefacts is essential if they are to be cared for properly and used to their fullest potential. 3.2 Accredited Museums will adhere to the requirements of the Accreditation Scheme in relation to the maintenance of Spectrum primary procedures for the documentation of their collections. 3.3 The aim is for collections information across the museums to be shared through a publicly accessible, searchable database (using MODES software). 3.4 Local Churches that care for historic artefacts are encouraged to follow the Church's guidance to complete a simple inventory record for all the artefacts in their care, regardless of age or wider significance, but particularly for any items of historical value (see 2.3 above). 4.1 A well informed and planned approach to caring for historic artefacts is fundamental to ensuring their long term preservation and potential for use. 4.2 Accredited museums will be responsible for maintaining and implementing 'Care and Conservation' policies, plans and procedures in line with the requirements of the Accreditation Scheme. 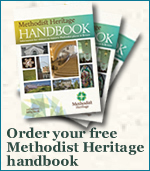 4.3 Churches and other Methodist heritage sites should follow the Church's guidance that signposts good practice ecumenically and across the heritage sector for the ongoing care of the types of historic artefacts they may have in their care, for example books, furniture, oil paintings, ceramics or precious metal and pewter ware. 4.4 The Methodist Heritage Committee should be consulted for advice when remedial conservation or restoration work is being considered for historic artefacts of Connexional significance. 4.5 It is strongly recommended that any remedial conservation work should be carried out by a conservator or conservation practice included on the Institute of Conservation (ICON) Register. 5.1 Promoting access to Methodist historic artefacts through, for example, display, research and loans, is part of their core purpose for the Church and is central to them being used to tell the stories of Methodist heritage and to realize their missional value. 5.2 The expectation is for the Methodist Church's historic artefact collections to be used in a dynamic and proactive way across its network of museums, churches, heritage sites and with partners to ensure that the unified story of the Methodist movement from the 1720s to the present day is interpreted for the widest possible audience. 5.3 The Methodist Church is committed to facilitating the widest possible access to collections information using digital portals as appropriate, for example through MODES on www.methodistheritage.org.uk or via posts on www.mymethodisthistory.org. 5.4 Guidance on loans, display, interpretation and digital access, will be developed and promoted to the Connexion in accordance with sector best practice.